The latest on the market providing the highest resolution offering fast problem solving and functionality ! At an affordable price ! Has 3 different types in order to be compatible with Apple Products, Android or USB. The improved FLIR ONE Pro gives you the power to find invisible problems faster than ever! Higher resolution in an updated design offers ability to stream to your smart phone (or watch) for remote viewing IMMEDIATELY ---in the field…perfect for farriers. Offers a real-time spot meter for regions of interest providing imagery sharper and is easier to understand the picture. 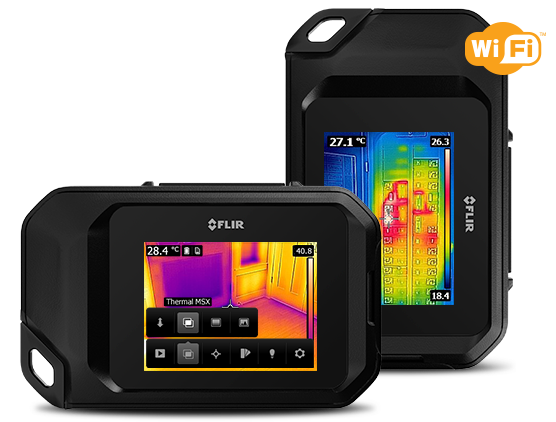 The FLIR C2 (no WIFI) & The FLIR C3 (with WIFI) is the world’s first fully featured, pocket-sized thermal camera. Powerful and Compact with a brilliant 3” touch screen is easy viewing. Save still images and streaming video in high resolution, a feature not usually available on low-cost thermal camera systems. Read over the Datasheets and Specifications on the 2 models we suggest now available on our website. The purchase of the “app” will be your responsibility once you receive your FLIR. Students: Contact Link Casey personally for more details. Call the office for the bottom line on cost, shipping and wait time. We find that more farriers shoeing for a living and people using the Equine Flexion Therapy Technique and Anatomy Studies of horses, along with thermal imaging are more prepared when approaching a questionable horse. If only for a self-training tool for yourself, your opinions you offer can be backed up and your work verified. If used during your daily services, you can easily get a return on your investment within 30-60 days. TRY IT! Other FLIR models we can sell are listed below. You can go to www.flir.com to read the specifications. Pictured Below: Clear signs of improper saddle fit. Taken with her FLIR One Pro Camera purchased here!